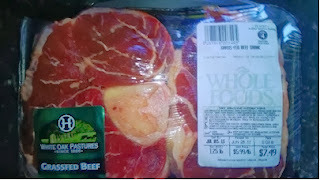 Tuit Nutrition: Awesome Cuts of Meat You're (Probably) NOT Eating: Beef Shanks! Awesome Cuts of Meat You're (Probably) NOT Eating: Beef Shanks! Do you stick to the tried and true when it comes to animal proteins at the grocery store? Do you automatically reach for the boneless, skinless chicken breasts, the ground beef, the London broil, the boneless pork chops, or the turkey sausages? Do you steer clear of the more gnarly looking stuff? Are you afraid to pick up a package of something unfamiliar because you haven’t the faintest idea what to do with it? Well, that ends today! Today’s post honors one of the less intimidating cuts, which is a great way for skittish newbies to dip their toes into the water and gently ease into this brave new culinary world. doesn’t mean I don’t shop there and find great stuff. BEEF SHANKS! Today we celebrate the beef shank, a cut that comes to us as a horizontal cut from the leg of the steer. Because of this, it’s got a roundish bone in the middle, surrounded by some pretty tough meat. 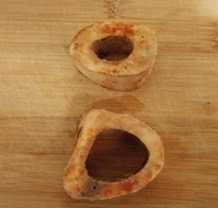 Cooked improperly, the meat from a shank bone can be difficult to eat. Because it’s from the leg, the muscles there are pretty hard-working. (How often do you pass by a farm and see the cows laying down pampering themselves? Not often. They’re usually on their feet, grazing happily on green grass. With all that standing all day long, those leg muscles get quite the workout.) So the meat there can be pretty tough, not to mention it’s loaded with connective tissue, just like our own bones, muscles, and joints. Connective tissue is extremely good for us, but it can be a challenge for even the strongest human jaws and chompers to gnaw through. So how do we reap the nutritional benefits from this imposing cut while also actually being able to chew it? If you don’t have a slow cooker, go buy one. Now. (I’ll wait.) If you’re not using a slow cooker on a regular basis, you’re missing out on one of modern technology’s gifts to the hurried, harried cook who wants to put real food on the table for themselves and their family. (Okay, maybe it’s more like 1950’s technology, so perhaps not so modern, but it’s not exactly a sub-zero fridge, or dipping things in liquid nitrogen, or whatever the molecular gastronomy folks are doing these days.) Long before the purveyor of the tabletop rotisserie uttered his famous tagline, the slow cooker was the original “set it and forget it” machine. So what do we do with beef shanks and a slow cooker? The simple answer is: throw some stuff in the slow cooker, let ‘er go on low for a few hours, and then chow down with smiles on our faces. The poetic answer is: make magic. The moist heat of the slow cooker braises the shanks into falling-off-the-bone tender masterpieces and makes all the collagen, gelatin, and other “stuff” locked away leach out and become über easy to digest and assimilate. The first thing to know is that slow cookers are extremely forgiving. There are certain things that don’t do so well in them, like leafy greens and broccoli. (They turn grayish and way too mushy for my liking.) But things that work excellently are root vegetables (potatoes, yams, sweet potatoes, parsnips, carrots, rutabaga), onions, and celery. Lucky for us, because onions, carrots, and celery also happen to make great accompaniments to beef shanks. With that in mind, I offer you the following recipe. However, like other recipes I’ve posted before, this is more a guide than a hard-and-fast recipe. I’ll post the basics and then give you some ideas on how to modify things. Place 3/4 of the sliced onions, celery, and carrots at the bottom of the slow cooker along with some of the rosemary. Sprinkle the salt, pepper, and paprika on the beef (both sides…you know what Emeril says: “I hate one-sided tasting food!”). 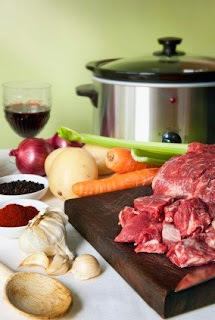 Place the beef on top of the vegetables (in one layer if your slow cooker is big enough; if not, it’s okay to overlap). Put the remaining veg & rosemary on top. Pour the canned tomatoes and juice over everything. If you have whole or stewed tomatoes, give ‘em a squeeze before they go in, just to break ‘em up and spread the tomato love around more evenly. Add the garlic and water, set the cooker to LOW, and let it go for about 5 hours. 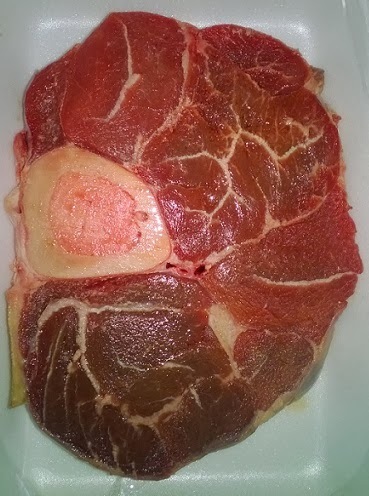 For those of you totally unfamiliar with beef shanks, this is what one looks like (raw). The roundish white thing at the left is the bone. The pink stuff inside the bone is the marrow. (It turns gray/brown when cooked.) And all the white stuff running through the meat that you think is fat marbling? Most of it is not fat, but rather, it’s connective tissue – stuff that is really good for us, but makes this cut hard to eat unless cooked low & slow. Double it! If you're gonna make a dish like this that you just throw into the slow cooker, you might as well make a big batch and have it last a few days. Use 3-4 pounds of beef shanks and add another can of tomatoes. No carrots? No celery? No problem! Maybe you have a cabbage that’s gonna die if you don’t do something with it soon. (I would only use green though, not purple. Napa and savoy varieties would also be fine.) Chop it up and put it at the bottom of the crockpot. Use the root vegetables I mentioned above instead of (or in addition to) carrots & celery. If you use frozen, chopped rutabaga, you don’t even have to defrost it before you toss it in! Adding more veggies (and a little more liquid) can make this meal stretch a lot farther if you’re feeding a crowd. You could probably double the amount of carrots & celery and you'd still be golden. Use other seasonings to change the flavor profile: ditch the paprika and try cumin, chili powder, and a tiny bit of cayenne (even better if you use canned tomatoes that include green chilies); or go Italian and use canned tomatoes with Italian herbs, and add extra oregano and basil. Toss in whatever else you want to get rid of: how about that last half glass worth of red wine from the bottle you opened a week ago? A splash of balsamic vinegar? It's all good! My photography skills (or lack thereof, really) and my servingware don’t do this justice. It’s delicious, I assure you, and the perfect thing for a winter night’s supper. Note: don't worry about the semi-solid, jelled state of your sauce. It'll re-liquify completely when reheated. 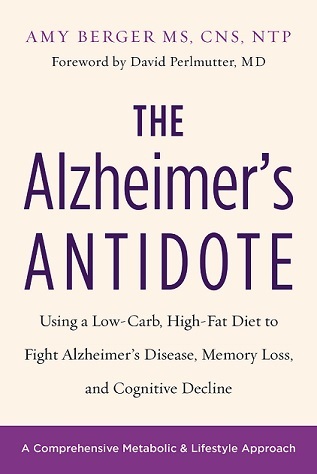 You know how, over the past century or so, we've skewed our fatty acid intake by eating less animal fat and more vegetable oils, so that we're getting way too many omega-6 fatty acids and not enough omega-3s, too many unsaturates and not enough saturates? 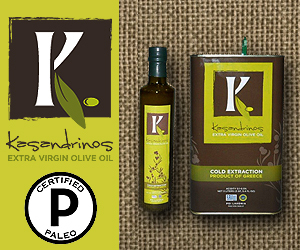 In exactly the same way, we have been skewing our balance of amino acids, the building blocks of protein. Gelatin-rich foods, from bone broths to head cheese to foods like pig's feet and ox tails, were a large part of a traditional diet. Our ancestors relished every part of the animal, and just as they ate organ meats that most modern Americans now spurn, they also ate all the gelatin-rich bony and cartilaginous bits of the animal. In this modern era of muscle meat and little but muscle meat -- think boneless skinless chicken breast -- much of this gelatin has vanished from the diet, but our bodies' need for it has not. their all in your stockpot. Do you have any favorite organ meat recipes? Share them in the comments. I need all the help I can get! And here's a great guide from the people at BroBBQ (hehheh) on various cuts of beef, what part of the steer they're from, and which cooking methods are best for them: 8 Primal Cuts of Beef. P.S. I can understand not having celery on hand, but you should pretty much always have onions and carrots. They’re pretty hardy and last a while if stored properly. (Even when just tossed casually into my fridge’s produce drawer, they tend to last a long time.) Canned tomatoes are also key to have in the pantry at all times. They’re so versatile and make last-minute meals really easy. Stock up when they’re on sale (sometimes even 10 for $10 at my local supermarket…can’t beat that!). Keep a variety on hand and you’ll always be able to throw something decent together in a pinch. Think stewed, diced, whole, crushed, plus the different seasonings I mentioned earlier—Italian herbs, green chilies, spicy, etc. Chef Michael Symon’s new book includes a list of pantry must-haves for the home cook that will ensure even the novices can prepare real meals in minutes. Canned tomatoes and onions are on there! P.P.S. 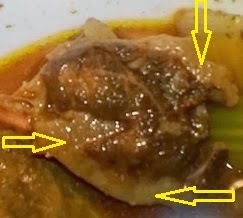 As with all cuts of beef, the shanks are loaded with nutrients. No, I’m not kidding. Vegetables and fruits do NOT have a monopoly on vitamins and minerals. 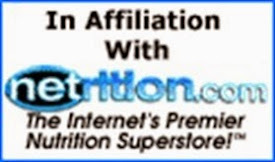 Scroll down in the link and check out the B12, B6, B3, selenium, iron, and zinc. And those numbers are for just 3oz of meat—less than you’d probably eat in a typical serving, so you’d likely get even more for a dinner-sized portion. This is way more delicious than any ol' vitamin pills! Thanks, Leni! 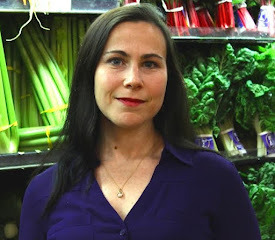 My first love is writing (even before food/nutrition), so I really appreciate the compliment! 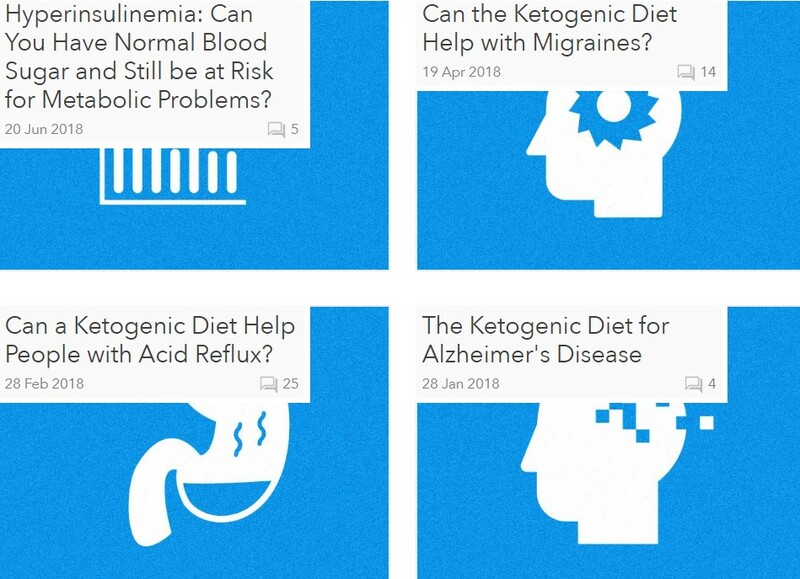 Thanks for the article, recipe, and a link to another useful health information site. May be able to turf my zinc supplements if I add this recipe into my meal planning. J. What a great discovery! 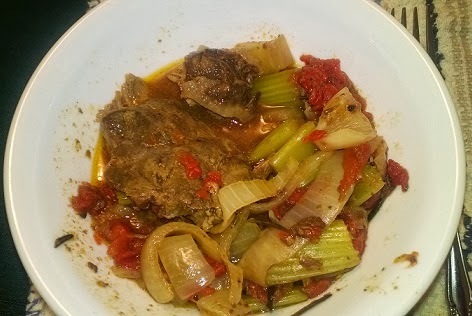 We plan to serve the beef shank recipe you provided above to 8 adults and 8 growing kids next Saturday and have a few questions about this recipe. What's the best amount to serve per person (including bone)? We only have 1 crockpot and 2 le crusset Dutch ovens and plan to use them all. We plan to put the Dutch ovens in the ovens for slow cooking. What are your thoughts on this? what a great discovery! we plan to serve this recipe to 8 adults and 8 growing kids (9-14 yrs) next Saturday. will a pound each (including bone) be sufficient? we have 1 crockpot (rather large) and 2 le crusset Dutch ovens. we plan to put the Dutch ovens in an oven low heat. will this work. Should we overlap meat inside the Slow cooker? will this work? thanks for your feedback! Childhood favorite on mine, I made it last night and have enough for 2 more nights. My mother would mash the potatoes and carrots together with a little broth and the marrow. Most delish!! And we would use ABC noodles with the broth as a soup to start our meal. So good for you and very filling. Would love to see your bone broth recipe. Thank you for the great info! After a recent trip to Jamaica, I made oxtail stew but thought it was so fatty I couldn't eat it, even though it was delicious. I repeated the recipe with beef shanks & loved it. Organ meats: whenever I roast a whole duck, I don't throw away the heart. I sauté it with fresh garlic, add a splash of white wine, let it rest, then put it in my mini food processor with a little grape seed oil, S&P, and Parmesan cheese to make a paste. I serve it with crackers. My local Asian market has fresh duck hearts by the pound. Any healthier ideas I can do with them? Thanks again! Putting beef shanks on my shopping list! I couldn't agree more with your post. Shanks are my son's and my favorite meal. I have a simple yet super delicious recipe...Put shanks in slow cooker and pour 1 - 1 1/2 cups of salsa over the top. That's it. The juice/gravy is divine. And the meat sooooo tender!